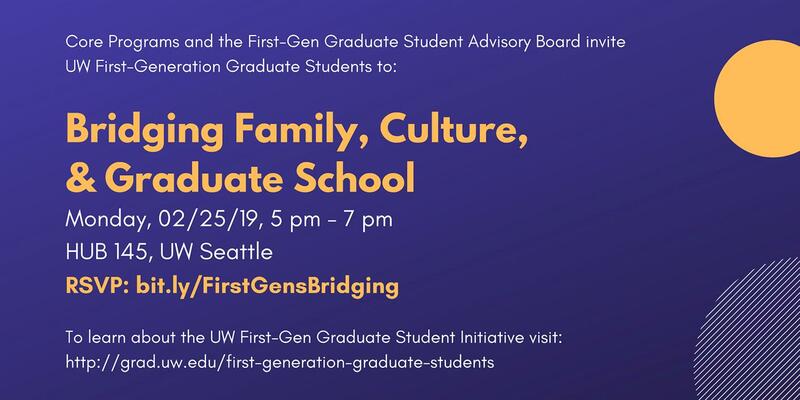 Monday, Feb 25, 2019, 5 – 7 p.m.
A moderated panel conversation for and about first-generation graduate students, featuring insights for navigating relationships with family, culture, identity, and graduate school—followed by Q&A. Dinner, refreshments, and community-building activities provided! *A first-generation graduate student is in the first generation of their family to earn a Bachelor's degree--and is now working towards a graduate degree. The University of Washington is committed to providing access, equal opportunity and reasonable accommodation in its services, programs, activities, education and employment for individuals with disabilities. To request disability accommodation, contact the Disability Services Office at least ten days in advance at: 206.543.6450/V, 206.543.6452/TTY, 206.685.7264 (FAX), or e-mail at dso@uw.edu. Photos will be taken during this event. Images may be posted on Core Programs websites, facebook pages, and graduate student outreach materials. Please feel free to contact Core Programs staff at cpinfo@uw.edu or (206) 543-1703, if you have any questions or feedback.